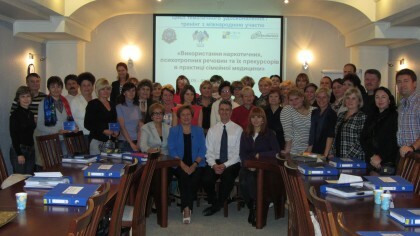 Dr. Chris Behrens (center) and participants at a pilot training event in Uzhgorod. In June 2016, the academic and professional communities involved in training family physicians and general practitioners in Ukraine received another valuable guide to a highly sensitive topic. The International Training and Education Center for Health (I-TECH) in Ukraine, the Ukrainian Family Medicine Training Center (UFMTC) at the Bogomolets National Medical University (NMU), and the International Renaissance Foundation, all under the auspices of the Ministry of Health (MoH) of Ukraine, published “Use of Narcotic, Psychotropic Substances and their Precursors in the Practice of Family Medicine.” This facilitator’s guide (published in Ukrainian) was developed by Ukrainian and international experts in the fields of palliative care, controlled drug use, and pain management. “The uniqueness of this publication is its extremely topical and, until recently, understated issue in Ukraine: provision of medical care with the use of controlled drugs, including opioid analgetics,” said Kateryna Amosova, Rector of the Bogomolets NMU. The guide incorporates recent, groundbreaking updates in Ukrainian legislation. Resolution #333 of the Cabinet of Ministers of Ukraine and Order #494 of the MoH legitimize primary health care providers to prescribe and manage opioids for pain management in palliative care and opioid substitution therapy (OST). The goal of this training curriculum is to provide participants with the skills and knowledge required to form competencies in applying narcotic, psychotropic substances, and their precursors in the practice of family medicine, specifically in combination with treatment of drug addiction, tuberculosis, and hepatitis. Participants work at the pilot training in Uzhgorod. The guide is based on the results of three pilot training events that took place in October through December 2015 in Uzhgorod and Kyiv. Dr. Chris Behrens, Clinical Associate Professor in the University of Washington’s Department of Global Health, co-facilitated the first event in Uzhgorod. Dr. Behrens also co-authored the guide, along with leading experts from the Bogomolets NMU, the Ministry of Internal Affairs of Ukraine, the National Police of Ukraine, the State Service of Ukraine for the Drug Use Control, the Ivano-Frankivsk Oblast Clinical Center for Palliative Care, the Kyiv and Kryvyi Rih City AIDS Centers, and the International Renaissance Foundation. Principles and use of narcotic and psychotropic drugs and their precursors in provision of palliative and hospice care, including patients living with HIV/AIDS. The MoH of Ukraine recommends this guide as a tutorial for clinical interns and doctors enrolled in in-service or continuous medical education training programs, as well as for faculty of the Ukrainian medical universities and colleges that train doctors and nurses as general practitioners and family doctors. The guide has been already disseminated to about 60 medical universities and the largest medical colleges in Ukraine.